Peanut Butter Caramel Cheesecake. Pumpkin Cookie Dough Studded. Vegan. No-Bake. 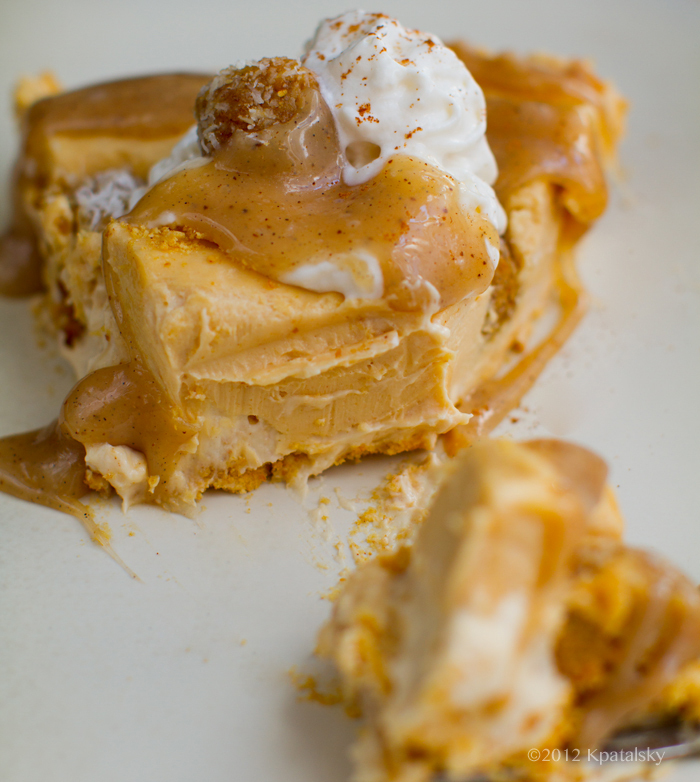 Today's decadent dessert recipe just kind of needed a long name.. Presenting my No-Bake, Vegan Peanut Butter Caramel, Pumpkin Cookie Dough-Studded Cheesecake. On a homemade crumble crust. 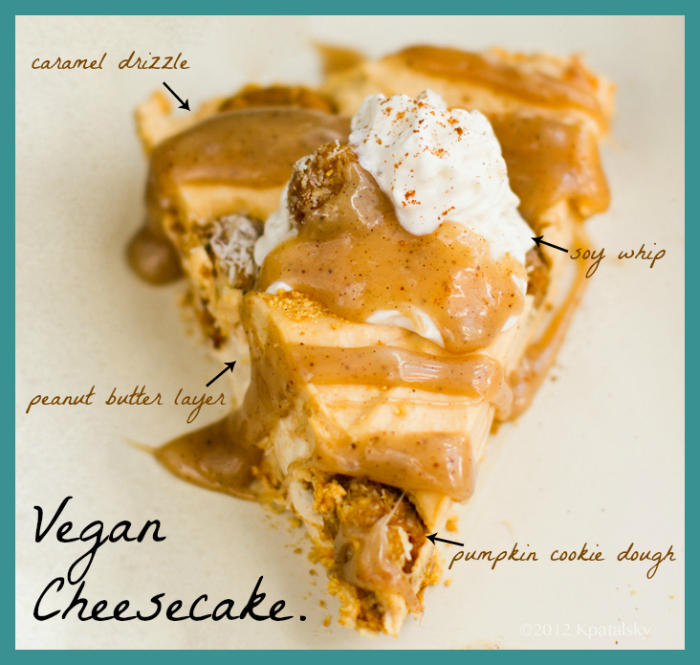 If you love peanut butter, vegan cheesecake, caramel and all things creamy-delicious, you want to try this recipe..
Homemade vegan caramel on top..
Before I dive in, I want to make sure you all check out my exciting (vegan) salad'tude contest news! One of YOU guys will win a $6,000 Napa Valley Culinary Adventure. Finalists will be chosen by me in early December. So please turn on your creativity thinking caps, grab your camera and favorite salad recipe and enter! Special Vegan Cheesecake. Slice into this luscious dessert and you will find two rich layers of vegan cheesecake: a sweet vanilla layer and a creamy peanut butter layer. Each layer is blended using virgin coconut oil and vegan cream cheese. 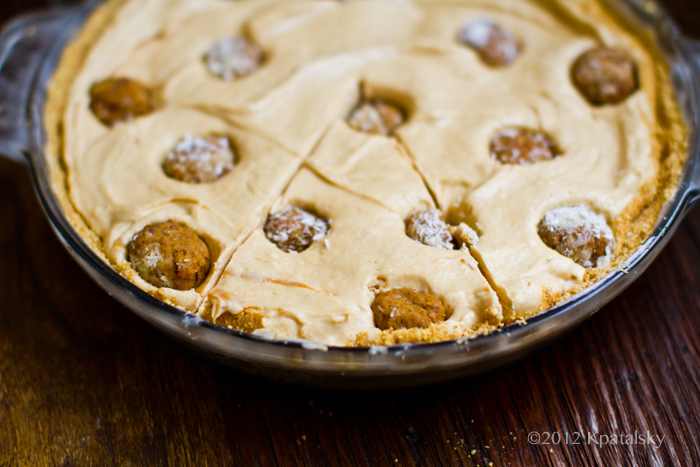 This graham-cracker crust cheesecake is studded with pumpkin pie cookie dough. A rich drizzle of vegan caramel on top. You can choose either a vanilla caramel or my peanut butter caramel. Accents of cinnamon and vanilla in each silky bite. I top everything off with a swirl of soy whipped cream and a pinch of cinnamon. OK, so yes this dessert is complex! Layers. Cookie dough accents. Homemade caramel on top. But that is what makes it so fun and special. I could easily see this cheesecake on a holiday table. Pumpkin Cookie Dough. The Pumpkin Pie Cookie Dough is pretty awesome. You can even bake it into cookies. You can see them as Pecan Pumpkin Pie Cookies on my Family Kitchen post. Toss 2-3 Tbsp vegan buttery spread or virgin coconut oil with 3/4 cup crushed vegan graham crackers, press into cheesecake dish and allow to harden in the fridge for at least 20 minutes. Pumpkin Cookie Dough - see detailed cookie recipe here. Basics: Combine the following.. Basic Directions: chill in fridge, roll into dough balls and roll in coconut shreds to make "cookie dough" for this recipe. 2. If you are taking that extra step and making homemade pumpkin cookie dough - bravo you mini Martha Stewart you! Prepare the dough and place in the fridge to chill for at least 20 minutes. Then roll into mini balls and place back in the fridge until needed. 3. Combine all the sweet cream ingredients in a blender or food processor. You could also use a basic beater or mixer. 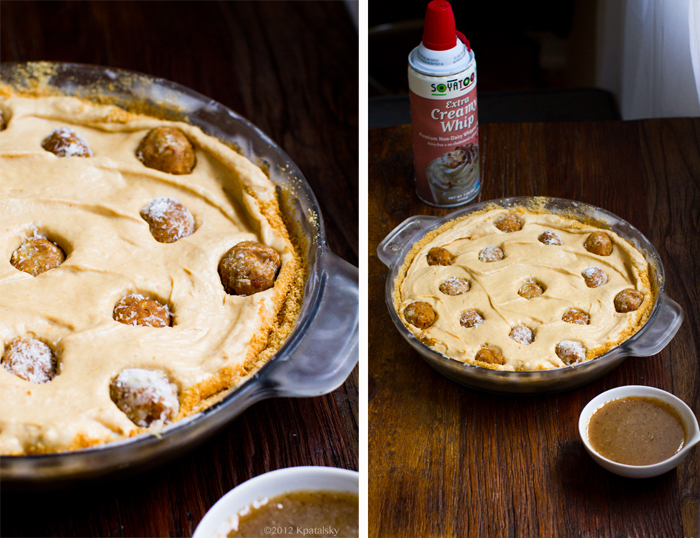 Pour the sweet cream layer into your crust dish. Smooth the sides. 4. Blend your peanut butter layer and pour over top the sweet cream mixture. Smooth out edges. 5. Grab your cookie dough and press it into the layers. 6. Place the cheesecake in the fridge to chill for at least a few hours. This will firm it up to a sliceable state. 7. While the cheesecake is chilling, you can prepare your caramel sauce. Heat the ingredients in a saute pan over high heat, until bubbling. The coconut cream and (peanut butter if using) should melt fairly quickly. Stir continuously with a large spoon or spatula. Allow for the sugar to dissolve. After a minute of intense bubbling, turn heat to low and stir for another minute or two. Turn off heat and pour caramel into small dish. Place in the freezer or fridge to chill. Once the caramel has fully chilled it will be in a sticky thick state and you will need to re-warm it in the microwave for easy drizzling. 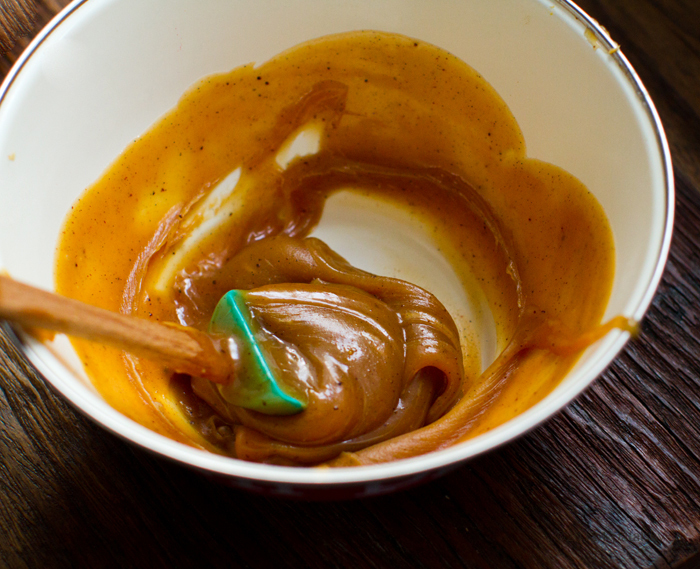 This post have more on my pb caramel sauce. 8. Serve! 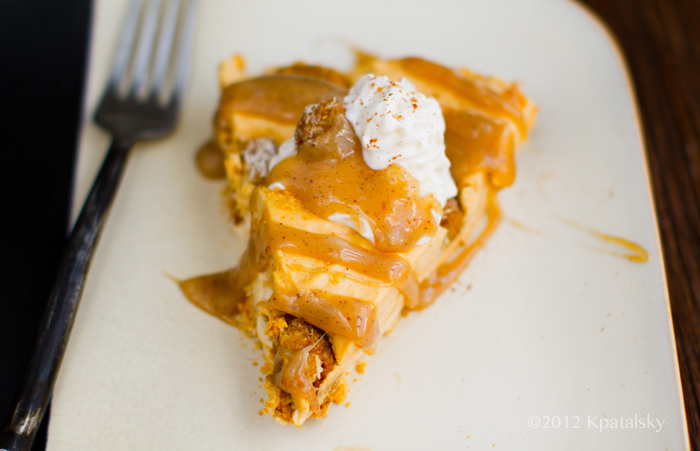 Slice up a piece of your cheesecake, swirl some soy whip on top and drizzle the caramel over top. Some cinnamon on top too. Serve chilled or wait a few minutes for the cheesecake to warm and soften. Adding warmed caramel will also help soften the cheesecake a bit. Store your cheesecake in the fridge. It will soften quite a bit when left at room temperature. * Easy Option! 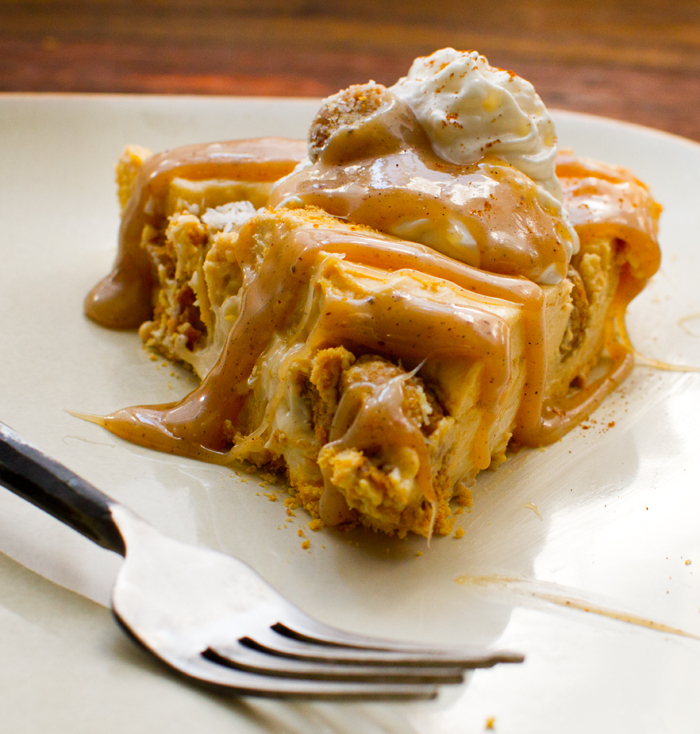 The pumpkin cookie dough is totally optional. 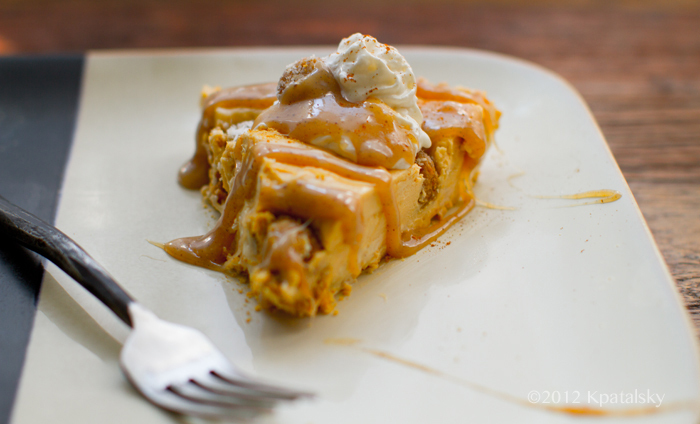 If you want to add some pumpkin flavor without adding the actual cookie dough, you could blend 1/2 cup of canned pumpkin into the sweet cream layer of the cheesecake. If you'd like to see what the pumpkin cookie dough looks like baked into cookies, check out my post on Family Kitchen. * If you are not a fan of soy and want to try a soy-free option, I'd suggest subbing the vegan cream cheese with soaked raw cashews. I have not tried this method for this exact recipe, but it is one option you could try. * You could substitute the peanut butter with another nut butter if you'd like. * The vegan caramel is optional, but advised! You can use either my basic vanilla coconut caramel or my new peanut butter caramel. 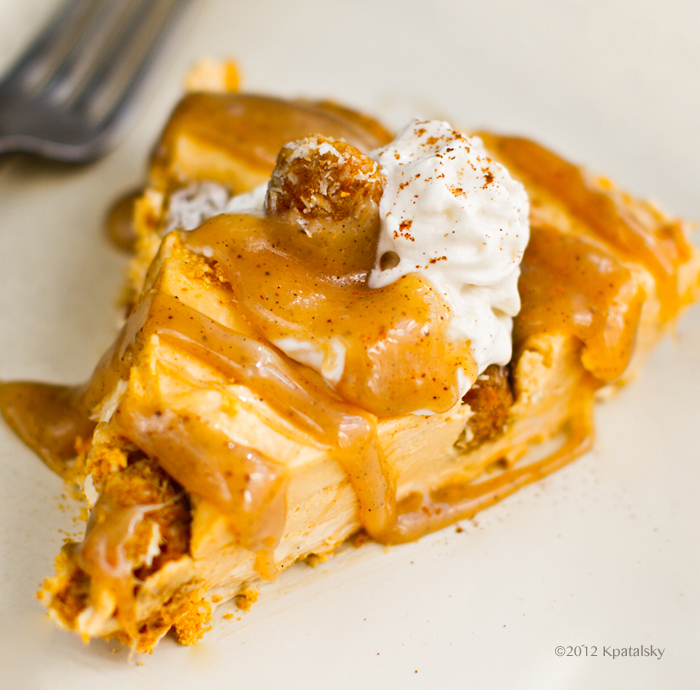 Or you could even use my Apple Cider Caramel Sauce shown in my Caramel Apple Pie recipe. * For the crust, you can use a variety of recipes. I used a very basic graham cracker crust. But I'd also love this recipe with a raw nut crust or a oat-nut crust - as seen in this recipe. * You can change up the sweetener if needed. Agave syrup will work in place of maple syrup. * When making the cookie dough, you can leave out the added flour if you'd like. This ingredient is important if you are baking the dough into cookies, but optional for dough balls. Just be sure to allow the dough to chill in the fridge so it firms up and thickens enough to roll into balls. OK, I know that was a lot of info! Hopefully you guys can try this one out! Questions? Comments? Let me know in the lovely comment section :) Happy vegan cheesecake-ing!